Place vegetables in rectangular baking dish, 13x9x2 inches. Pour dressing over vegetables. Cover and let stand 1 hour to blend flavors. Heat coals or gas grill for direct heat. Remove vegetables from marinade; reserve marinade. Place vegetables in grill basket or directly on grill rack. 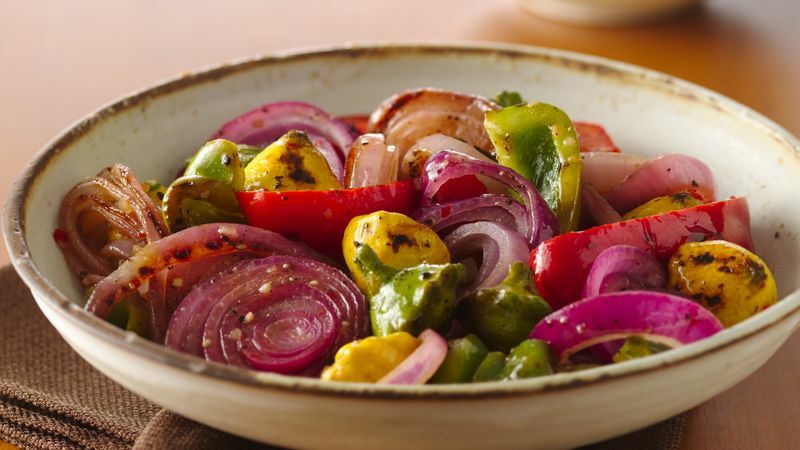 Cover and grill vegetables 4 to 5 inches from medium heat 10 to 15 minutes, turning and brushing vegetables with marinade 2 or 3 times, until crisp-tender. Sprinkle with pepper. Pattypan squash is a variety of summer squash. Round and slightly flattened, this small squash has a scalloped edge. Find it in grocery stores and farmers’ markets. One medium zucchini, cut into 1-inch pieces, can be used in place of the squash. If you like mushrooms, go ahead and add them for the last 10 minutes of grilling. If you don't have a grill basket, make sure the vegetable pieces are large enough so they don't fall through the grill rack. Cut the vegetables the same size so they'll cook in the same amount of time. Or remove vegetables from the grill as they become done.